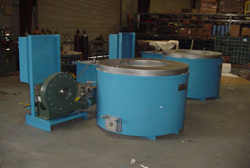 Pyro Industrial Systems Inc. has over 35 years experience in making custom Crucible Furnaces. Check out any of our models from Aging Ovens, Batch Ovens, Composite Ovens, Conveyor Ovens, Heat Treating Ovens and Lab Ovens on the links below. Pyro Industrial Ovens are built of the highest quality components in the industry using only the best in quality materials to make our products last a lifetime. If you can't find a Crucible Furnace of your choice please be sure to either contact us or fill out a request form.